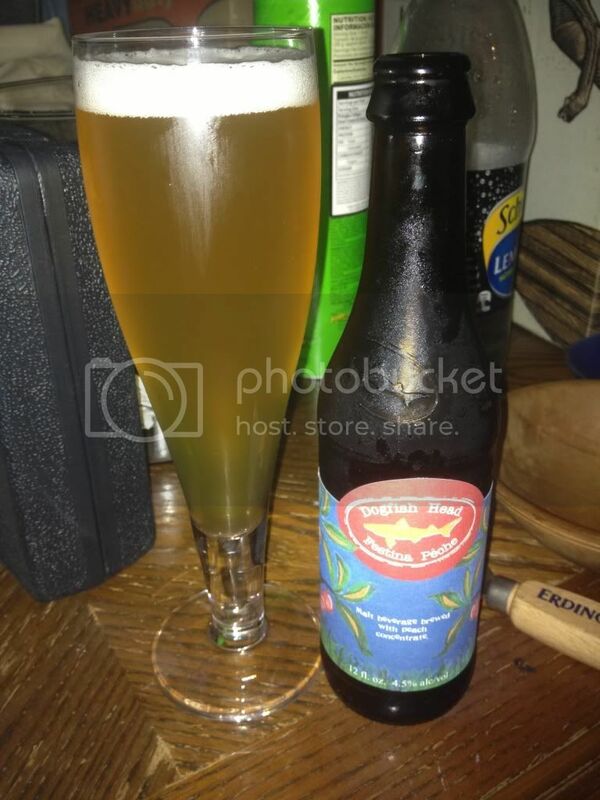 Today I've got a real treat to share with you, DogFish Head's Festina Peche. It's a neo-Berliner Weisse that's been fermented with peach juice. It sounds delicious so I can't wait to get into it now! DogFish Head is one of the premier craft breweries in the United States. It's known worldwide for it's amazing IPA's and I don't think I've had a beer from them before that I haven't loved! Recently Acland Street Cellars brought in a heap of their rarer stuff including this so watch this space for some more DogFish Head stuff in the near future, for now it's reviewing time! Festina Peche pours a very light yellow colour, which is reminiscent of other Berliner Weisse beers I've had. This probably wasn't the optimum glass for the style but it was clean, which is more than can be said of alot of other glassware in the bar. There appears to be some small bubbles rising to a brilliant white head that is incredibly shortlived and fades to nothing very quickly. The nose has a lovely sour smell with hints of wine, green apples and peach all present. For something with alot of fruit aromas the overall smell has almost no detectable sweetness. I can't recall the noses of many other Berliner Weissbiers that I've had but I doubt that this one was like any other one I've had. I've never smelt anything like it before! OK so the beer has big wraps, the appearance looks right for a Berliner Weissbier, the aroma is like nothing I've ever had and the flavour is.... awesome! The overall feel of the beer is sour but there is a respite when the fruitiness of the peach comes through. There's some wheat characteristics in the flavour which helps the mouthfeel feel more rounded; even though it is still very light and bubbly. If I was to be extremely tangential I would say it's beers answer to champagne, with sour peach flavour as an added bonus. DogFish Head's Festina Peche is a lovely example of when a sour meets a fruit beer. The balance between the two elements is often overplayed by brewers but this is well balanced and although their is no overt sweetness the peach flavour still comes through strongly. If you like sours and can get your hands on this beer do so, it's really impressive and very refreshing.